Karaoke, Kids, and Minneapolis Sculpture Garden fun! Mike Hoyt and his Norae Shanty seem to be attracted to Minnesota’s extremes. 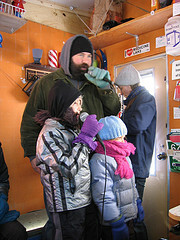 The last time I was singing karaoke in the Norae Shanty (when I met the Zoll family) it was sitting on inches of frozen ice, the weather was below zero, and I was wearing at least five layers of clothing. Tomorrow the shanty will be perched on the green grass of the Minneapolis Sculpture Garden in the 90-degree heat waiting for families to fill it with sound at the Walker’s Free First Saturday. Karaoke isn’t the only fun happening at this City Pages A-Listed event. You and your family can create an art project and installation inspired by Frank Gehry’s Standing Glass Fish, see a performance by local ska band Umbrella Bed, and take a tour of the sculpture garden together. The Norae Shanty is based on Korean karaoke rooms called “ Norae bangs” (song rooms). The Norae bang (pronounced “ nō–rāy–bŏng”) is essentially a scaled down version of a karaoke bar, a small room with karaoke equipment and comfortable seating that groups of people rent by the hour. These bangs provide participants with simultaneous visual, audible, and emotional experiences. Yet unlike the sometimes competitive and embarrassing nature of the karaoke bar experience, the norae bang provides up to a dozen participants a cheerful and supportive environment for a more comfortable exchange. Ice fishing and ice house culture is similar to the bang phenomenon in Asian urban centers. Bangs, like ice houses, serve as a retreat, a small and isolated space for groups to participate in a shared activity away from the stress of everyday life. The Norae Shanty was developed to provide new and intersecting populations with the opportunity for soulful exchange. To preview a list of tunes you can sing and to learn even more about his Norae Shanty check out Mike’s website.